The home furnishing industry in India is a great opportunity for companies to capture. Its market in India ispegged to be around USD 20 billion. Moreover, a large number of unorganized players exist who are not able to cater effectively to the demand due to logistics and infrastructure issues. This led to a number of start-ups in this space, backed by big VCs. One of them is the Goldman Sachs backed Pepperfry. Pepperfry is a furniture and home décor marketplace, owned and operated by TrendSutra Platform Services Private Limited. This company is a wholly owned subsidiary of Trendsutra Cyprus Ltd., incorporated in Cyprus. It operates on a marketplace model and competes with Urban Ladder and Livspace in the furniture e-retail segment in India. Another key player in the segment is FabFurnish which operates on an inventory-led asset-heavy model. 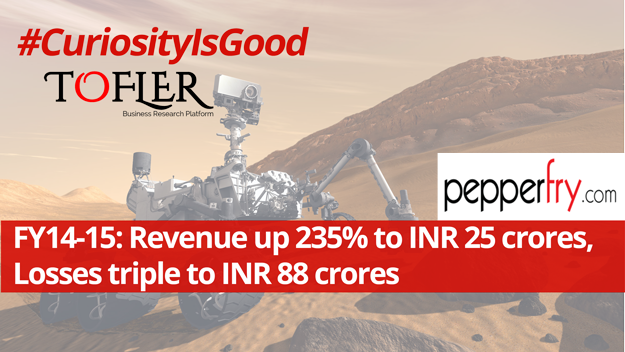 The company reported a revenue of INR 25.3 crores in FY 14-15 against a loss of INR 88 crores. This is a revenue growth of more than 200% from INR 7.5 Crore in the previous fiscal. 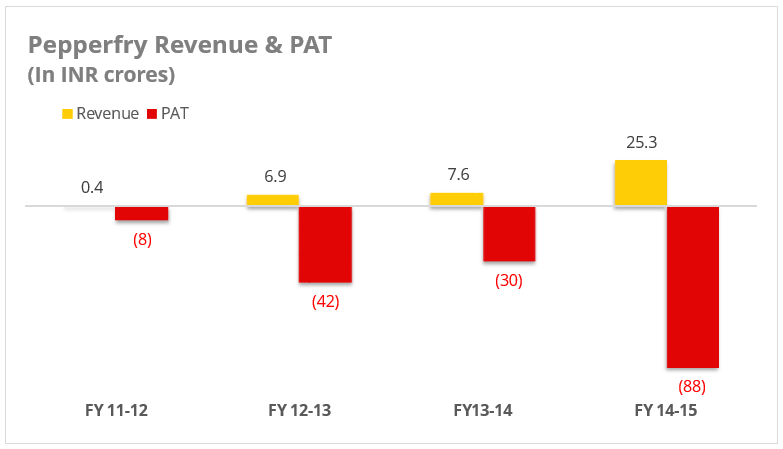 Losses nearly tripled from INR 30 crores in the previous fiscal. In comparison, it close competitor Urban Ladder had reported a revenue of INR 19 crores and a loss of INR 58 crores in the same period. In FY 14-15, Pepperfry‘s expense on ‘Advertisement and Business Promotional Expense’ shot up five times of that in FY 13-14. It was the largest head in their total expenses, accounting for about 60% of it. 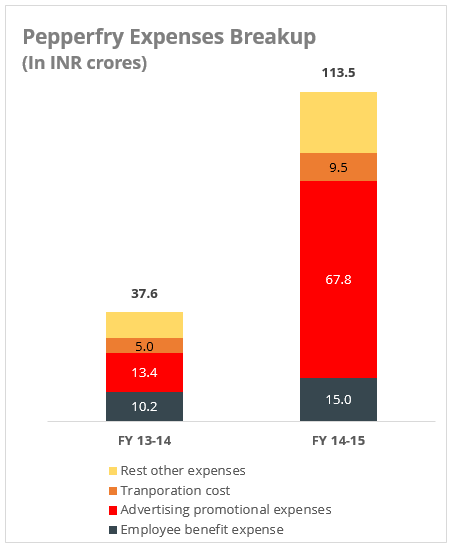 Employee benefit expenses stood at INR 15 crores, 13% of total and 1.5 times of that in the previous fiscal. Pepperfry was founded by Ashish Shah and Ambareesh Murty (both former eBay employees), in July 2011. According to their website, it covers more than 1000 cities in India, has more than 2 million registered users and more than 1000 merchants on its platform. They claim to have fulfilled more than a million orders. Pepperfry currently leads the online furniture market and sources most of its products from Jodhpur. All of their funding has been routed through their holding company TrendSutra Cyprus ltd. Total funds of INR 433 crores have been infused into the company with latest being INR 179 crores in October 2015. In comparison, Urban Ladder has raised funds of INR 460 crores so far. These companies are incurring huge Advertising and Promotion expenses, Pepperfry and Urban Ladder spent INR 68 crores and INR 40 crores, respectively on the same. For the time being it might be justified as the furniture e-tail market is in the early stage of growth and is yet to mature. They also offer heavy discounts to attract customers who have become accustomed to the offline unorganized retail sector. How long will this trend continue and when will these companies become profitable, if they do at all, is something that we will have to wait and watch out for.